Basketball season is upon us. I am a big basketball fan and I also coach my kids’ teams, so I am pretty attuned to the change of sports seasons. As both a coach and a fan of the college and pro games, I am pretty psyched. As a coach, I am starting to think about what my practice plans will be, the offense and defense, how to teach and drill but still keep it fun. One of the great things about basketball is that the game has flow and rhythm, it is not just a series of plays that start and stop like football and baseball. One of the keys for me in coaching is to teach the kids how to read and react to situations to keep things flowing. Most baskets are not scored from the initial play but from a reaction to the defense or by being opportunistic, like getting an offensive rebound. You need a great team to achieve success. You can win without stars (or beat teams of stars) if you execute perfectly. 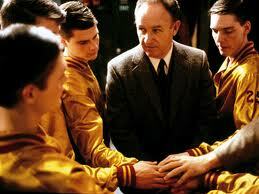 The movie Hoosiers shows us that. No matter how good your plays or your plan, reacting to the situation is more important. Plan B, C, D and beyond are crucial. This is why the best offenses are not about running a play, they are about a framework for scoring. Plays and systems are just guides, ultimately you need to think on your feet and react in the moment. All teams need to play offense and defense. Strategic planning is often about thinking “what if” enough times. All players can improve skills and fundamentals to help the team win. Teams get better when individual players get better. Tenacity and scrappiness can take you a very long way. In basketball, rebounding and getting a loose ball often make the difference in winning. In startups, you get told “no” a lot more than yes—from customers, investors, friends, you name it. But the most successful entrepreneurs power through all that.